When someone new joins the team here at Array, I give them the “teaching hospital” speech. Well it’s more of a philosophy than a speech, and a simple one at that: We need to continue to grow and find ways to teach others what we know. Admittedly, I get a chuckle from the team every time I call Array a teaching hospital. But through the years I’ve seen the team practice this philosophy. Not only has it has made us stronger as a team, but also cheerleaders for one another. So when I finished Atul Gawande’s book, “The Checklist Manifesto,” it seemed like a natural fit to share with the team. Atul Gawande is a surgeon who became interested in a problem that affects us all in today’s modern world: avoidable mistakes because we don’t make proper use of what we know. He shares examples from the medical field of routine tasks surgeons perform and how competent doctors frequently make mistakes due to a simple missed step, forgetting to ask a key question or getting caught up in the pressure of the moment. Gawande visits other occupations that share in the responsibility of protecting life and how they go about doing so. As Gawande questions pilots and architects, he soon discovers what these equally important occupations have in common: checklists. These checklists are short and concentrate on the everyday routine tasks one can tend to overlook. Here at Array, we are grounded in process (checklists! ), both at the micro and macro levels. At the micro level, a simple checklist walks our designers through the process of setting up a file and sending it to print, whereas the macro degree would include our 8-step checklist called “The Array Process” (check it out here: http://www.arraycreative.com/about-us/what-we-do/). This unique development process is effective regardless of the product, target audience or industry. Not only has it contributed to the success of our clients, but to the success of Array as an agency as well. 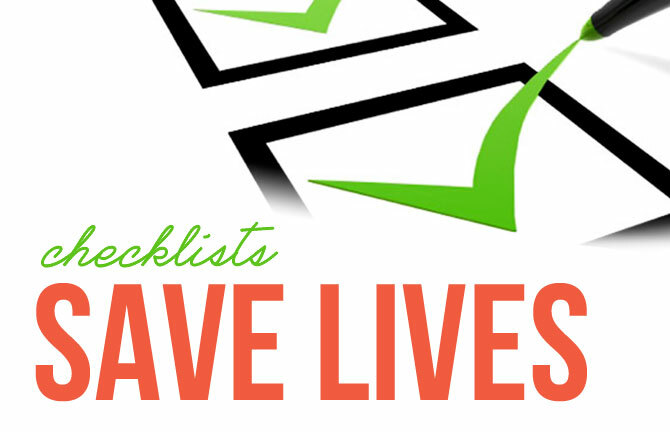 Simply put, no matter your level of expertise, a well-designed checklist reduces mistakes. I am proud to say that I walk the halls of this “teaching hospital” of an office and proclaim, “checklists save lives!” And yes, they still chuckle.